Everbuild 505 Plasterers Gripcoat Primer Coating is an extra grip plaster bonding agent that contains a fine aggregate to provide an improved key before applying the plaster skim coat on many smooth and difficult surfaces. The fine aggregates are suspended in a unique gel to ensure easy application by roller or brush and an even spread of aggregate avoiding any weak spots in the key coat and preventing the aggregate particles coming loose during skimming. Can be used on many smooth and difficult surfaces such as glossy painted surfaces, textured paints, particle board, MDF, waterproof plasterboards, fire boards, pre-cast concrete and even ceramic tiles. One easily applied coat will allow over skimming onto surfaces that would otherwise need meshing, removing or seriously keying and reduces labour time. 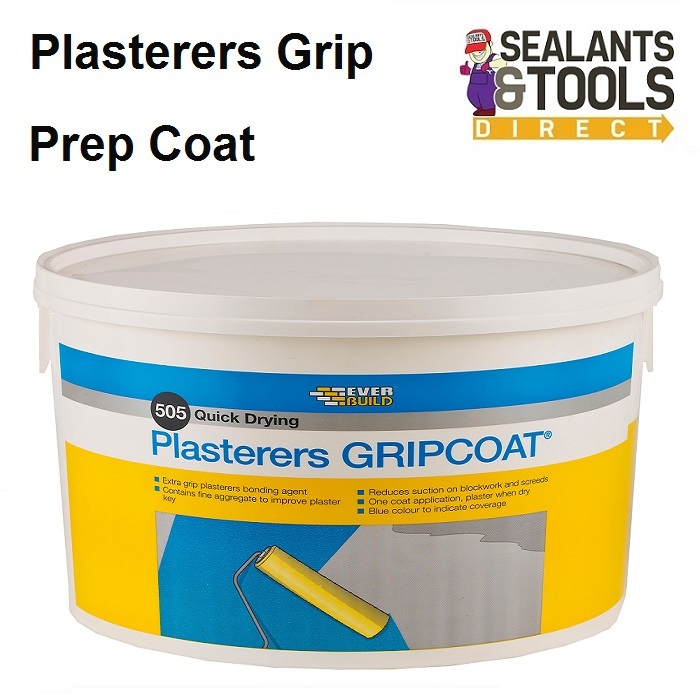 Plasterers Gripcoat can also be used to provide a non-absorbent surface that reduces suction on blockwork and sand and cement screeds keeping the skim coat workable for longer. It can also be used to retard plaster skim coats on larger areas where you need to keep a wet edge. Extra grip plasterers bonding agent. Contains fine aggregate to improve plaster key. Reduces suction on blockwork and screeds. One coat application, plaster when dry. Blue colour to indicate coverage. As a bonding agent for plaster to difficult substrates such as glass, ceramic, MR Plywood, MDF, precast concrete and plasterboards. As a bonding agent for plaster over textured surfaces.